We consider ourselves problem-solvers first, attorneys, second. We are advisors in the conference room and advocates in the courtroom. We resolve conflicts. In today's competitive business arena, it is more important than ever to resolve legal issues quickly and effectively. We partner with clients like you to understand your personal and business needs and goals. Then we carefully evaluate each case on its own merits and map out a customized strategy to get the best possible result as quickly as possible. We look for every opportunity to get a judgment in our client’s favor without having to go to trial. If that is not possible, we have had great success combining excellent pre-trial litigation with effective negotiation to obtain positive settlements for our clients. And if trial is necessary, we make sure that our clients are totally prepared for the courtroom. 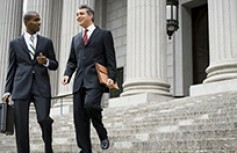 As consummate client advocates, we represent builders, developers, brokers, appraisers, business lenders/financial institutions, large and small companies and individuals in general civil litigation throughout Georgia and the U.S.